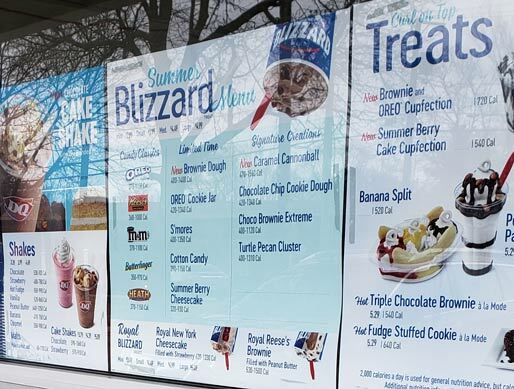 [New for Spring 2019] Did you know that the DQ summer blizzard menu is up already? (Just like last year!) The DQ by my work just opened a few days ago and they're already talking summer! Ok, I can only complain so much because at least they have two new blizzards for me to try instead of having to go with the typical minty March option. So which one did I try? 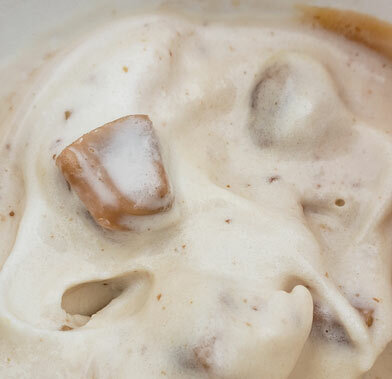 Originally I called the toffee pieces "some kind of crunchy/poofy mix-in (and maybe something else)". DQ didn't post the description until April 1st, so I all I knew was that I saw the DQ employee throw in a big scoop of some light colored crunchy bits. For whatever reason, after blending, most of them seemed to be at the top. Here's a closeup. So it's those typical little filled truffles we've seen in many other frozen treats, but these have the outer coating that is caramel flavored as well. They are plentiful and fun enough, but don't expect a big blast of sweet, buttery caramel from them. 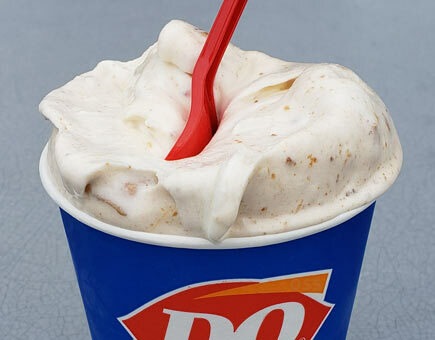 In fact, this blizzard never really leans in the buttery direction. It's sugary enough, but not buttery caramel sweet. It's definitely more about the crunch factor, though at one point I started thinking I was tasting a bit of heath bar mixed in (update: knowing they are toffee pieces now, it makes sense that I got a bit of a heath vibe). I don't know if cannonball is supposed to be the caramel version of a malt ball maybe? Unfortunately I tend to get confused when a flavor is stuck in the middle like this. I feel like it's trying to be something, but whatever that something is, it's not winning me over. Weekend Note: Besides the very tasty new Brownie Dough blizzard (reviewed here), DQ also has two new "Cupfections" (Summer Berry Cake (reviewed here) and Brownie made with Oreo cookie) as well as two new "Cake Shakes" in either Chocolate or Strawberry (reviewed here). My wife loves the cake shakes from Cold Stone so in theory we'll go to DQ again shortly. Our local DQ hasn't flipped over to the April stuff yet, bummer. As with all Dairy Queen reviews, your own blizzard mileage will vary from server to server. This is awful tastes like cardboard. Never getting it again. I miss Salted Carmel Truffle. Why do they end the good ones. Definitely recommend trying the cake shakes. @Anon: really didn't like those crunchy bits?? @Sascha: we actually did, though there were hiccups.... I should post it at some point soon.